Four favorite "models" belonging to George Wilson Jr. (Walpole, Mass.) 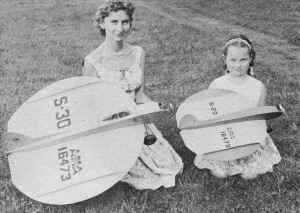 include full-size radio control Canadian Saucer from A.M. and 20" free flight version. Mrs. Wilson with daughter June completes favorite foursome. This indoor hand-launched balsa won the Nationals for Jack Block with time of 69.2 seconds. Control line combat "fighters" employ simple constructions; there are Mexican contenders. Another non-contest scale model slowly gaining popularity is the ducted-fan powered type. These are scale models of modern jet fighters having 1/2A engines driving small diameter impellers instead of propellers. Engine and impeller is enclosed within fuselage structure resulting in clean scale appearance. Thrust output of the ducted fan is relatively low so that very lightweight free flight construction must be used. With the rapidly expanding popularity of radio control model flying a contest category for flying scale R/C models has recently been established. This is the ultimate in flying scale, to be able to control the model through take off, flight and landing - "look ma, no hands!" R/C scale models follow the usual pattern of R/C construction and design. They are like rugged free flights and in addition are able to carry the radio payload and are finished and decorated like their scale prototypes. There are no limitations on engine, model size or R/C equipment in competition flying. Models are judged for scale fidelity and workmanship as in other flying scale events. Bonus points are awarded for scale operating features and models must demonstrate R.O.G. take off, straight flight, procedure turn, straight return flight, figure eight, rectangle and landing. 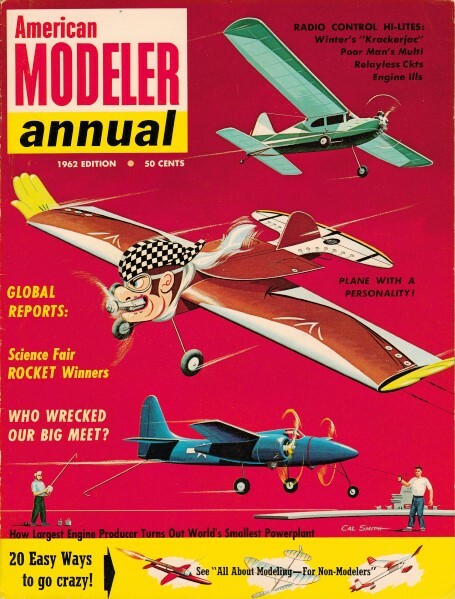 Scale monoplane and biplane types are favored, .09 to .35 engines powering 3 to 5 ft. span models being popular sizes. RADIO CONTROL - Most advanced phase of all model flying, radio control combines many of the features of free flight and control line with the big added attraction of true remote control-"no strings attached". The models, though specialized designs, have typical free light structures somewhat beefed up and control system linkages similar to those used in control line models. 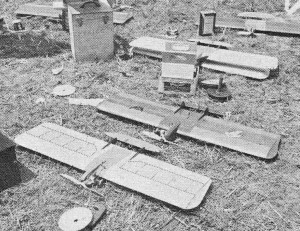 Early radio control models were usually converted free flight cabin designs. 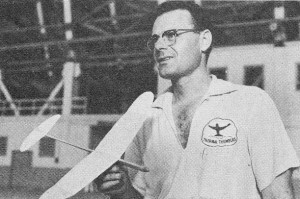 Few modelers tackled radio control flying because a radio operator's license was required by Federal law. This involved lengthy examination and training in radio theory. These stifling FCC requirements have since been changed, so that now anyone can use approved factory built model radio control equipment without being a "ham". Transmitters are "registered" with the FCC. ices in target drones and missiles. A typical "full-house" control system, model and engine represents an investment of about $300 flying around in the air. Add another $100 plus for transmitter, batteries and ground test equipment and the price tag becomes pretty steep: But don't lose heart, it's a matter of the more .controls, the more the expense. At the other end of the scale you can put up a small single control R/C model for under $100. Typical simple R/C trainers have about 4 ft. wing span and are powered with .09 or .15 engines-many kits are available for this and more advanced types. There are smaller models with 1/2A power and even Pee-Wee .020 powered 2-footers that can be flown inside a high school gym. The small trainer or sport types utilize the simplest R/C equipment. A single control, the rudder, is operated by radio. Basically the small "rudder-only" R/C model is a stable free flight design usually of high-wing cabin type. The R/C equipment needed consists of a battery powered handheld transmitter on the ground and in the model, a small receiver with hearing-aid batteries for power, a rubber-powered self-neutralizing escapement and linkage to move the rudder. The R/C model is underpowered by VTO free flight standards but this produces a shallow rate of climb and climb flying speed is close to gliding speed. Model is trimmed for straight flight and rudder control is used to steer model into and out of flat turns in the air-space around the flyer. By holding rudder hard over, model can be made to spiral dive picking up considerable speed. When opposite control is given model will straighten out and recover in a zoom. The excess speed and zoom can be used to perform other fancy maneuvers by proper timing of rudder control signals. Enough fuel is carried for prolonged engine runs of 2 to a minutes. When fuel is used up, model can be steered in the glide down to a landing. Radio control flying requires open space comparable to that needed for free flight flying, but small models can be flown within the confines of a football field in calm weather. In addition to transmitter, receiver and other model control equipment, test meters are needed for ground checks of battery voltage and receiver and transmitter tuning. Add to the list plastic tuning wands, wire strippers, resin-core solder and small soldering iron for assembling wiring circuits.